The spare wheel is carried in the wheel well under the floor panel in the luggage compartment. It is only intended for temporary use over short distances. – Lift the floor panel by the plastic handle ⇒ fig. 268. – Hook the handle onto the luggage compartment weatherstrip. – Turn the centre plastic knob ⇒ fig. 268 anti-clockwise. – Take out the spare wheel. – Unhook the floor panel before closing the boot lid. 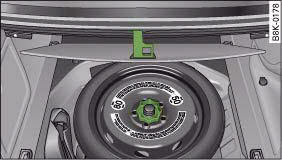 – Place the wheel in the spare wheel well and secure it with the plastic knob. Should you ever have a punctured tyre, the compact temporary spare wheel is only intended for temporary use until you can reach a workshop. The standard-size road wheel should be refitted as soon as possible. Please note the following restrictions when using the compact temporary spare wheel. The compact temporary spare wheel is designed specifically for this model. For this reason, do not use a temporary spare from a different type of vehicle. • The tyre pressures must be checked and corrected as soon as possible. The tyre pressure of the compact temporary spare wheel must be 4.2 bar – an incorrectly inflated tyre can cause an accident. • Do not drive faster than 80 km/h - higher speeds can cause an accident. • Avoid heavy acceleration, hard braking and fast cornering – risk of accident. • Never use two or more compact spare tyres at the same time – risk of accident. • No other type of tyre (normal summer or winter tyres) may be fitted on the compact temporary spare wheel.